Three-piece tool design dramatically reduces the weight of large repeat and wide web tooling. Manufactured using high-chrome tool steel, hollow tooling sacrifices nothing in performance, at a fraction of the weight of solid dies. Reduced weight means lower shipping costs, when new and when shipped for future reconditioning. 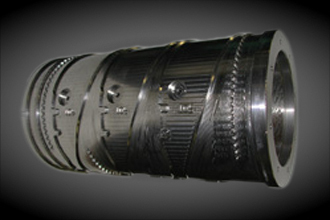 Hollow tooling also offers the ability to pump heat or cold through the die to apply different temperatures to the web as required. Used as a "chill" roll with cooling systems, these tools can be used to help "set" adhesives on hot melt coating lines.